Herndon is building a new trail (June 2005) to connect from an existing Fairfax County trail on the eastern side of Sugarland Run to the W&OD Trail. 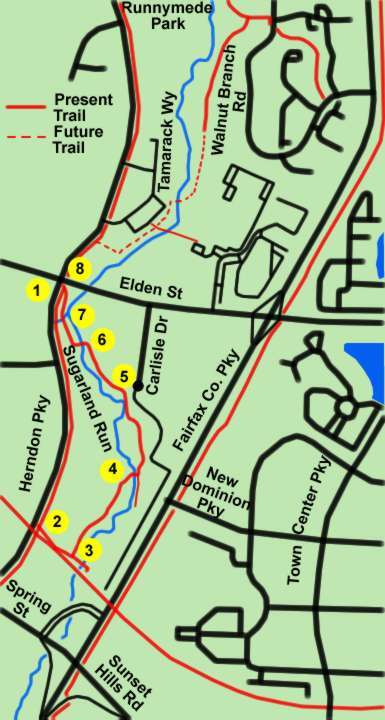 (The existing Fairfax County trail is shown on the Sugarland Run Stream Valley Map on this site.) The section of new trail between the W&OD Trail and Elden Street has been paved and is suitable for use. The section north of Elden Street is still under construction. This guide gives directions for a loop walk on the paved section of trail. The walk starts at the intersection of Elden Street and Herndon Parkway. You might park in one of the shopping center parking lots near that intersection. Walk in a southerly direction on the sidewalk along Herndon Parkway with woods on your left. The W&OD Trail crosses Herndon Parkway on a bridge. Just prior to the bridge turn left to follow a crushed stone trail up the hill. At the top of the hill at the junction with the W&OD Trail turn left to follow a paved intersecting trail back down the hill. A paved trail intersects from the left at the bottom of the hill. Turn left to follow that trail. The trail turns right to cross a bridge over Sugarland Run. An old trail intersects from the right. Stay on the new trail as it turns left to follow Sugarland Run. The picture shows construction equipment putting finishing touches on the land around the trail. The trail crosses Sugarland Run again and follows it on the other side. This was a construction entrance for the trail. The trail crosses a stream at this point. The trail intersects with Elden Street back at the start of the walk.